While answering a comment yesterday the old saying “Out of sight, out of mind” popped into my head. I have talked at times about how decluttering makes it easier to clean your home; having fewer items to clean and fewer things to move so you can clean under them certainly makes the job easier. This is the obvious clutter. What about those items that are hidden away out of sight. By the time I started my 365 Less Things challenge most of my clutter was out of sight because I am a bit of a neat freak. The hard work of making our belongings fit in to this smaller house was already done in the two years prior to this quest. Nonetheless, “out of sight” certainly wasn’t “out of mind” for me. I knew that the storage areas of our home were packed to capacity and something had to be done. I needed to have enough space in the cupboards to get things organized and easy to find, and I craved a little more open space around me where there was furniture whose only purpose was to store more stuff. Slowly but surely our cupboards and wardrobes are all starting to become more like transition areas from where things regularly come and go rather than permanent tombs for items we no longer need or want. There were several pieces of storage furniture that are no longer filling up rooms and giving me those open spaces I craved. And the lessons I have learned along the way have cleared my mind of craving more things that would just waste the precious space I have worked so hard to find. Not matter what stage you are at – whether you are still trying to find the floors or working on stuff hidden behind doors – every little thing that goes is one step closer to a lifestyle that you can be comfortable with physically and mentally. You may want to work quickly at first to find those floors then settle down to a slower pace but keep at it and don’t give up because trust me it is worth every effort you put into it. 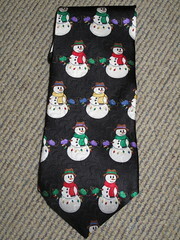 I know some of you are probably thinking “Oh bah humbug Colleen” but if you knew my husband you would know he isn’t the kind for wearing ties never mind ones with snow men on. I am not even sure how we ended up with it in the first place. Enough sunshine to dry the sheets – It kept threatening to rain but I think Mother Nature was just teasing me. Cappuccino – I know coffee isn’t good for you but I don’t care. Cheap Tuesday – More naughty food but pizza won’t kill me, or will it. Documentaries – If I am watching TV I would rather it be educational if not I’ll settle for funny. The freedom to stand up for what you believe in – Another one of those things we take for granted at times. Even when we have that freedom we don’t always have the nerve to do it but when the two align it does feel good. but “out of sight” certainly wasn’t “out of mind” for me. but “out of sight” certainly wasn’t “out of mind” for me. That is exactly how I feel – I know it’s there and I want it gone – and I won’t stop until I’m satisfied with the result. This post is on familiar ground for me – it was when our clutter started exceeding our storage that I first began to feel uncomfortable about it. This took a long time as we had a large house with lots of cupboards and closets and a full basement, but over the years of just storing items instead of choosing what to keep and what to let go, eventually we reached our storage limit. Then, all at once we needed to store items from a closed business plus numerous items from a parent. It completely overwhelmed any open spaces we had. At the same time our usual clutter was still expanding into corners of rooms and on top of furniture. I have stemmed the tide of incoming items, and dealt with a fair bit of our stuff, but I feel like I had a close call and will never be complacent about it again. I am lucky I haven’t had to deal with some of the unexpected clutter that you have had. It is not an easy task to deal with it all at the moment it enters your life that way. I think it is better to take your time to choose what should stay and what should go and have the time to redeem as much value out of it as possible. Especially in the case of a closed business you would want to realize as much worth as possible I would think. Keep working away at it and you will be so satisfied when you are done. Oh… I can SO relate to this one! Except that I’m not a neat freak by any stretch of the imagination. My problem is that every shelf, every cupboard, every drawer, every closet is completely full. So everything just ends up in a pile on the desk, or table, or floor. And the situation has gotten more complicated since the “new” kittens (now a year old) have grown up and can no longer be contained… so everything breakable had to be packed away, and every thing is “a toy” according to them! It’s revealing some serious drawbacks to my “file by pile” system! But I’m working on it. In the past few weeks I’ve given away a big box of books, moved another box worth down to the storage room, moved stuff out of the kitchen and into the storage room so that the cupboards aren’t quite so crammed full (still a lot of work to do on that front) and while I was in said storage room, I got rid of an electric frying pan which I have actually never even used. I bought the thing for a demonstration I was going to do at a free market, and then ended up not doing. My “pack rat” side was saying keep it, but fortunately I recently read the book “Slow Death by Rubber Duck” and will NEVER use anything Teflon again… so to FreeCycle it went! I know using the storage room is sort of a cop out, but the “I might need this” voice just won’t shut up! It’s an improvement at least. Next on my list… going through the desk drawers and creating some space there… I’m dreading it… there are piles of old floppy disks and zipdisks some of which I know have sensitive info on them and must be erased before I can either toss them or donate them… which means dragging out the old PC that can read them… But I’m going to persevere! Thanks for continuing to provide inspiration! I think artists and handypersons find it harder to part with those “I might need this” items more so than anyone else. We tend to be very good a looking outside the box and seeing the potential to use things for reasons other than for what they were intended. I will give you some things to consider though. 1.) Was there anything that you moved down to the storage room that you couldn’t pick up on Freecycle if you decided you needed one. 2.) Was there anything you moved down to the storage area that you couldn’t live without even if you did decide you had a use for it. 3.) Would you consider donating the items you moved to the storage area if they are still unused in 6 months? 4.) What is more important to you – Being prepared for a rainy day or living every day happily clutter free? OK… well let’s see… your points are very well taken. I think it might be easier to start by going through what’s already in the storage room. The thing is… there’s stuff down there that I thought I’d never use again, but sure enough, I ended up re-purposing some of it this summer…. but there is always FreeCycle for this purpose…. It’s worth another look. I really think that a bunch of my attitude has to do with living the vast majority of my life on very little income. I’ve always figured that I’d rather spend my time doing things myself than doing something for someone else so I can make money to hire someone else to do things for me. “Making do” is sort of a way of life for me. But there does come a point…. I understand there are only so many hours in the day and you seem to have them pretty much full of other work pursuits to find time for housework and I can understand that. Like you I am pretty good at doing for myself rather than getting someone to do things for me but you seem to have it down to an art form. I am envious of you because I am at a stage where I would also rather work for myself than being taken advantage of by big business which is why I just quit my part time job. All I have to do is figure out what I want to do while you seem to have that all sorted. Good for you. Your idea to work on one area at a time until it becomes a habit it a great approach and I hope it works for you. Even if you only added a new area once a month you will get there in the end. I wish you luck. I look forward to hearing how you are progressing. Thanks so much for your support. I wouldn’t say I’ve got ANYTHING about life “all sorted out” not by a long shot! I just think that work, like life, is a constant work in progress. Congrats on quitting your job! WOO HOO!!!!! BTW – you totally inspired me, so I did some re-arranging and sorting and I now actually have some counter space in the kitchen!!! I moved about 6 boxes of crap downstairs, and have a big pile for ebay/freecycle/donations. I am glad to have been of help to you and it is entirely my pleasure. Actually you have just inspired tomorrows post. Symbiotic relationships are a marvellous thing. My mind can go off an quite a tangent when answering comments and that is a great thing at times. Even though what you wrote doesn’t necessarily relate to my resulting post I still got there through my unique thought process due to you. So please don’t be insulted when you read the title of tomorrow’s topic. Hi Rebecca – This comment may get lost in this thread, but for what it’s worth, here it is. You mentioned having to erase old disks – if you already know you will be disposing of them, you can destroy them with a hammer instead of erasing them. Of course, this doesn’t work if you need to review them to decide if there is anything you need to keep! Ha! My boyfriend, the uber-geek was just telling me the same thing last night. Except he says that if you want to be totally sure nobody can read them, you have to cut the actual disk inside, not just break the plastic covering. So now I come up against environmental guilt… maybe somebody could use them…. aaarrrrggghhhh!!! Like you, I think I’m at the stage where the obvious clutter is gone and now I’m tackling the stored and out of sight clutter. I keep going through the same drawers and closets and getting rid of more and more stuff with every inspection. I keep wondering if I’ll ever be done or will this be a continuous process. At times I get weary, but then I get renewed motivation and energy and go at it again. Like you I have gone through the same areas over and over again. I don’t think that we missed anything the first time it is just that we have got more selective as time has gone on. The more we embrace the minimalist feel the more stuff we are willing to part with. I don’t care if I have to go over these areas several more times until I am satisfied that is just part of the process. judging by todays comments anyone who has been at this decluttering mission for a while learns to become more ruthless as time goes by. This is no surprise to me but it is nice to see the evidence of it in writing. I read somewhere (decluttering is one of my favourite subjects!) that you should always try to keep an empty shelf. I love this idea and now have one in my wardrobe, and one shelf in the under cupboard stairs. I can’t remember the original significance of it….something along the lines of having room to embrace new opportunities perhaps. My empty shelves keep moving. One day they are in the kitchen and then I reorganize the display cabinet and move things from there to the kitchen and the next thing I know the empty shelf is in the display cabinet. At least it is still somewhere I suppose.